Though rainforest terrariums are often beautiful, they are not simple. When you include live plants, branches and decorations in an terrarium, you reduce available cage space, which often results in a cramped cage that the inhabitants quickly destroy. Because of this, small and sedentary animals make the best pets for rainforest terrariums. Given the number of tropical invertebrates in the world, it should be no surprise that many creatures are suitable for the rainforest terrarium. Pinktoe tarantulas (Avicularia sp. 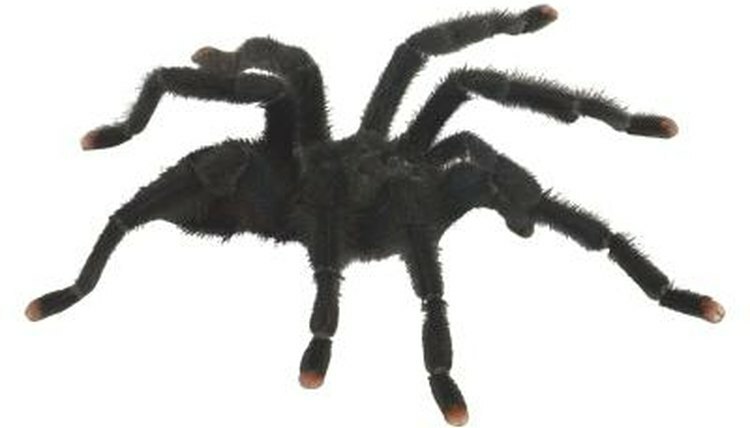 ), are the best choice for beginners, though species like ornamental tarantulas (Poecilotheria fasciata) and cobalt blue tarantulas (Haplopelma lividum) are suitable for more experienced keepers. In captivity, provide these tarantulas with humid, low-light terrariums containing plenty of live plants and bark for hiding. Keep the terrarium’s temperature between 80 and 90 degrees Fahrenheit, and feed the tarantula crickets or roaches twice a week. Emperor scorpions (Pandinus imperator) also make satisfactory inhabitants for rainforest terrariums; their care is similar to that of the tarantulas. Terrestrial snakes don’t make good subjects for rainforest terrariums, as they quickly destroy plants and props with their activity. Green tree pythons (Morelia viridis), Amazon tree boas (Corallus hortulanus) and emerald tree boas (Corallus canninus) are sedentary snakes, content to coil on elevated perchesfor extended periods of time; and thrive in rainforest terrariums. Tree pythons and boas need several branches in captivity for climbing and perching. Keep the habitat in the low 80 degrees Fahrenheit, and mist the snake and habitat periodically to maintain the humidity and provide drinking water for the animal. The cage should be allowed to dry out between mistings, as constantly saturated humidity levels are not appropriate. Captive snakes require roomy terrariums; provide adults with cages about 3 or 4 feet in length and 18 to 24 inches in height. While tree boas and pythons are not good snakes for beginners, intermediate and advanced keepers will enjoy their beauty in a rainforest terrarium. Red-eye tree frogs (Agalychnis callidryas) are beautiful, tropical amphibians that can be kept in rainforest terrariums. Tropical frogs are sometimes difficult to maintain, so they aren't recommended for beginners. These frogs can be kept in small groups and are most comfortable in vertically oriented enclosures packed with live plants and branches for climbing. Hobbyists are wise to purchase captive-bred specimens, as wild-caught frogs are often stressed, parasitized and dehydrated. Tree frogs are insectivores who will consume crickets, roaches and mealworms offered at night. By installing red lights for nighttime viewing, you can observe the nocturnal red-eyed tree frogs going about their nightly activities. Dozens of other frog species are suitable for rainforest terrariums and have similar care, including poison dart frogs (Dendrobates sp. ), marsupial frogs (gastrotheca cornuta) and reed frogs (Heterixalus sp). An assortment of small, arboreal lizard species thrive in rainforest terrariums. Central American anoles (Anolis sp. ), tokay geckos (Gekko gecko), flying geckos (Ptychozoon kuhlii) and crested geckos (Correlophus ciliatus) are some of the more popular choices for rainforest terrariums. Of these, crested geckos are among the easiest pet lizards to maintain and the best choice for beginners. Crested geckos don’t require expensive lighting systems and are comfortable at relatively low temperatures. Temperatures in the high 70s Fahrenheit are perfect. Additionally, crested geckos can subsist entirely on commercially produced food, somewhat similar to baby food; which makes feeding the lizards much easier for the average hobbyist. These lizards inhabit the tropical island of New Caledonia. They were thought to be extinct until the 1990s. In the terrarium, they will appreciate and use as much height as is provided to them, and they will utilize included plants as hiding spots and egg deposition sites. The key to success with any rainforest terrarium pet is to match the habitat with the animal. If an animal is naturally found in the rainforest, and is small and sedentary enough that it doesn't destroy the habitat, it will likely work in your terrarium. Exceptions include true chameleons (Chamaeleonidae), who require significant ventilation -- which is at odds with a rainforest terrarium -- and herbivorous lizards and turtles that may consume toxic plants in the enclosure.